Game of Thrones continues to be the #1 series on Xfinity On Demand and in celebration of the final season, we’ve launched an immersive, one-of-a-kind destination on Xfinity X1 in partnership with HBO that includes every episode, character recaps, season wrap-ups, behind-the-scenes interviews, extra web content, and more. Plus, we’re giving everyone the chance to catch up on the entire series all week long and enjoy the first episode of season eight on Sunday during the final hours of Watchathon— for free. Now and throughout the final season, X1 customers can select which Game of Thrones character they believe will claim the Iron Throne by saying “For the Throne” into the X1 voice remote. 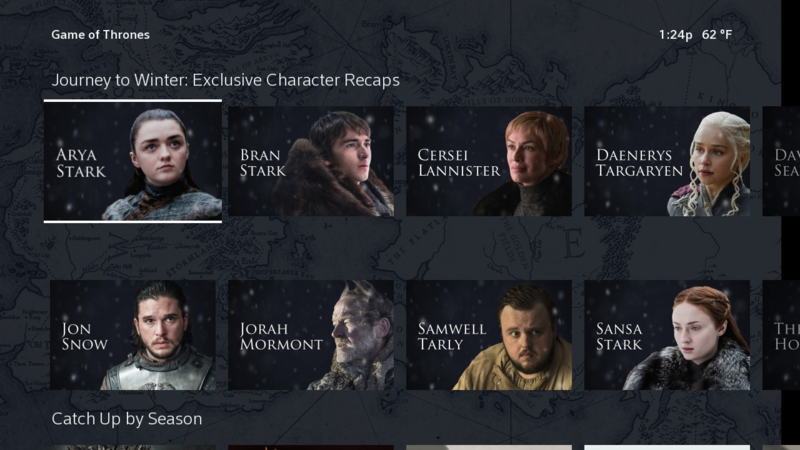 This new polling feature can be accessed at any time and enables customers to make their selection, see how it stacks up against other viewers in real time, and opt to send a special Game of Thrones badge featuring the selected character to their mobile phone to share their allegiance across social networks. As the twists and turns of the show unfold each week, customers can update their king or queen selection as often as they would like by saying “For the Throne” into their voice remote. X1 customers can say the name of several of the show’s main characters including “Khaleesi,” “Jon Snow,” “Tyrion Lannister,” “Jaime Lannister,” “ Cersei Lannister,” “Arya Stark” and “Sansa Stark” into the voice remote to hear some of the character’s most iconic quotes spoken back to them. These new audio “dragon eggs” will remain on the platform throughout the season. X1 customers can explore a one-of-a-kind Game of Thrones destination on Xfinity On Demand by saying “Winter is Coming” into the X1 voice remote. The ultimate Game of Thrones hub for fans will feature exclusive content including: individual character recaps from the Game of Thrones cast members; 60-second series summaries from celebrities like Bill Hader and Henry Winkler; a video montage dedicated to all the characters who died; behind-the-scenes footage like special effects, locations, and costumes; a Throne Room Yule Log to set the mood for their watch party; the latest Game of Thrones news via YouTube; and Game of Thrones-inspired playlists from Pandora and more.